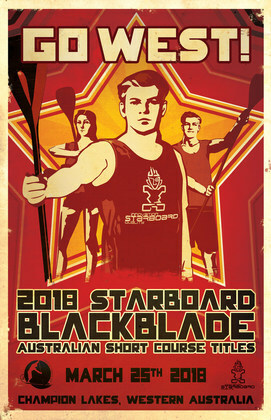 Exciting news ahead for this year’s Blackblade we have reduced the SUP short course distance to 3.7km. SUP’s will now complete 2 x laps of the main race course with the inclusion of a “Boomerang” turn at one end . “You choose when and where to complete the turn which adds another tactical element to the race – should excite the Technical Racing Paddlers!" Race numbers are drawn from a hat to create a starting list for 200m heats, paddlers are then ranked into A,B and C races for the 200m final and 500m sprint race according to their heat times not age groups, this means we will have the fastest paddlers matched against each other. Paddlers will choose their lane according to the heat seeding. The short course race will be a mass start. To achieve a fair outcome over the 3 distances your time in the 200m is doubled the 500m stays the same and the short course time is divided by 3. This modern, tried and tested handicapping system means you have to well in all distances to take out the title for your age division, but can make up time in distances you are better at. It’s a twist on just flatwater racing, it’s paddling consistency – sorts out the ultimate paddler – whether a Downwinder paddler, Flatwater racer or SUP Surfer – who’s got the Engine, Endurance and Tatics. Paddle Loopers have not been forgotten novices can enjoy the day in a safe environment, we will have a 200m Race and a 2km course for any board size! We will again this year be inviting OC and V1 paddlers to race over all distances a trophy will be awarded for 1st,2nd and 3rd in the Overall category and a medal for the fastest OC over 200m. SUP and OC paddlers don’t often get to race at a world class venue with certified photo finish timing so get your entries in early and start training and GO WEST for this great day of racing.